In 1990, a group of senior Brussels-based conference interpreters established Cii to provide a truly professional service to clients worldwide. Since then, Cii has organised thousands of international events to the satisfaction of its clients and established itself as the undisputed standard-setter in the field. We know from experience that each client, and each meeting is unique. Call us and we will be happy to discuss your needs and suggest the best solution to make your multilingual event a real success. We work with you from the get-go to provide a seamless organisation of your multilingual conference. A dedicated project manager who's always available. We can also provide state-of-the-art audio-visual and interpreting equipment. Tout d'abord un grand merci pour l'excellente qualité d'interprétation que vous nous avez fournie! Ils étaient tous très compétents et d'une rapidité magnifique! Je vous prie de ne pas oublier de leur transmettre ces compliments car ils le méritent vraiment. I just wanted to say thank you for the excellent translation job that you did at the conference. There were superlative comments from our French-speaking friends [...] The conference provided a model of how top-level interpretation on this complex subject is a key to a successful, engaging, stimulating event. Thank you again and I hope to be in touch for future events. The entire audience agreed that the interpreters provided with your kind help did a great job. 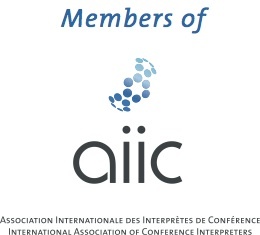 Cii has been recognised officially as a group of consultant interpreters by the International Association of Conference Interpreters (AIIC). All Cii partners are members of AIIC.